Australian independent non-bank lender Mortgage Ezy is the latest to join the growing list of alternative financiers providing funding to foreign property buyers. The group has a $500 million commitment from a warehouse facility of an international bank to provide loans using a securitised model. “It will be the first of its kind in that the whole pool will be only for non-resident borrowers and there is strong evidence to suggest that a bond such as this will have strong investor interest and will be able to be securitised,” Mortgage Ezy founder Peter James said. About $100 million in loans have already been approved since February, representing only the “tip of the foreign buyer lending iceberg”, Mr James said. He estimated the size of the foreign lending market in Australia to be about $1.5 billion a month, especially after the big-four banks departed from foreign lending. Mr James said $500 million would be exhausted in the next three months given present appetite of the market. Mortgage Ezy has strict lending criteria – borrowers must not have purchased more than 10 per cent of a building, have enough funds in the bank locally or overseas and the right visa class. Loans are capped at a loan to value ratio of 75 per cent, at interest rates of 4.79 to 7.95 per cent, depending on each application. The higher the LVR the higher the interest rate but a 75 per cent LVR is maximum. Only properties in metro capital city areas would qualify. 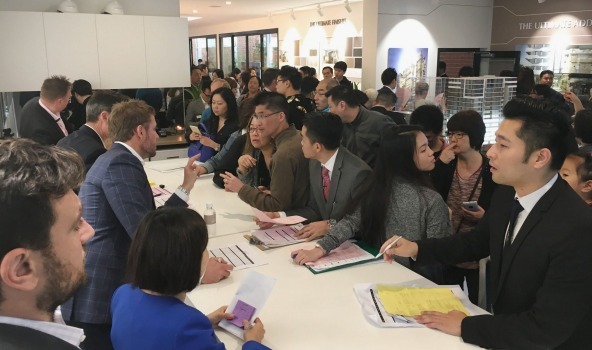 Ensuring the sales entered into by foreign buyers are settled is paramount to ensuring the market does not “slump”, Mr James says. The Chinese capital restriction was the only thing stopping them from settling their acquisitions, he said. “If foreign buyers left, they may cause a slump in property prices and confidence in the market overall. In addition our reputation in Asia will be severely damaged,” Mr James said.